35 years after it launched, the Voyager 1 spacecraft has officially moved beyond the heliosphere - but it's apparently still a step away from interstellar space. On September 5, 1977, Voyager 1 launched from Cape Canaveral, beginning a journey into space that would bring it into close contact with Jupiter and Saturn and the moons that surround both. But its travels did not end there; it continued to push out into the solar system, becoming the most distant man-made object from the sun in 1998 and beginning an exploration of the heliosheath - the region of the heliosphere beyond the termination shock, where solar winds are slowed, compressed and made turbulent by their interaction with the interstellar medium. And now, based on changes to radiation levels detected last year, the craft has moved beyond the heliosphere and the boundaries of our solar system. On August 25, anomalous cosmic rays detected by the probe dropped to less than one percent of previously registered amounts, while galactic cosmic rays that originate outside the solar system more than doubled in intensity. That shift, according to Bill Webber, professor emeritus of astronomy at New Mexico State University in Las Cruces, is what you would expect from an exit of the heliosphere. A report to be published in Geophysical Research Letters, a journal of the American Geophysical Union, states, "It appears that [Voyager 1] has exited the main solar modulation region, revealing [hydrogen] and [helium] spectra characteristic of those to be expected in the local interstellar medium." Even so, there is still some debate among scientists as to whether Voyager 1 has actually entered interstellar space or is merely in a "separate, undefined region beyond the solar system." "It's outside the normal heliosphere, I would say that," Webber stated. "We're in a new region. And everything we're measuring is different and exciting." Exciting indeed. Unfortunately, we're not going to learn much about lies beyond our garden fence; Voyager will begin shutting down its instruments in 2020 and at some point after 2025 its power supply will be exhausted. After that, we just have to hope that it doesn't someday come home with a head full of questions and an existential void in its soul. 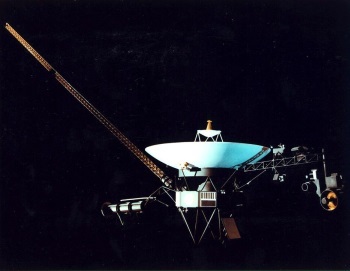 UPDATE: Further to the "some debate among scientists" business, NASA has issued a statement stating that it believes Voyager 1 is still here, although in a part of "here" that we weren't aware existed until now. "It is the consensus of the Voyager science team that Voyager 1 has not yet left the solar system or reached interstellar space," Voyager project scientist Edward Stone said. "In December 2012, the Voyager science team reported that Voyager 1 is within a new region called 'the magnetic highway' where energetic particles changed dramatically. A change in the direction of the magnetic field is the last critical indicator of reaching interstellar space and that change of direction has not yet been observed."